Discussion in 'Tank Journals' started by Rostato, May 17, 2018. I’ve had this tank for a few months so I’ll be playing catch up. First, I almost burned down the condo I was renting when an American DJ strip had a switch melt down and start a fire...luckily I was home when it happened otherwise it would have burned down for sure. Then, a few days later my skimmer went nuts while I was at work, and I flooded the condo...this was my fault because I was collecting skimmate in a container without a shutoff valve...totally my fault. This caused a couple thousand dollars worth of damage to the condo below mine. Then I had all the fish in my tank die a few days later...I assume it was due to the stress of the tank overflowing and not being heated and no oxygen exchange for 7 hours. Or maybe it was some unknown disease. Anyway, long story short, I quit. So I bought a house and have been working on it nonstop for 4 years. I suddenly got the itch to get VP back into the hobby since things are settling down. My wife encouraged me since she loves coral and fish. So, I bought this tank used off Craigslist with full equipment fish and some corals. Like most used tanks it had, and still has its set of problems but nothing major so I jumped on it. My goal when moving the tank was to keep everything alive and have no cycle. So I came up with a game plan. So, I bought a ton of buckets and lids from home depot for the live rock and water. I Brought 2 big coolers with battery operated airstones for the fish and inverts. When I got there the seller (who was awesome and helped a ton) and I broke the tank down keeping as much tank water as possible before we disturbed the sand bed. Then we scooped out, and threw away the sand bed, then scrubbed all the equipment and tank. I loaded up the back seat of my truck with 10, 5 gallon buckets full of tank water and live rock and put the coolers in the front seat with me. Then I kept the trucks interior temp at 80 degrees the whole way home fro Santa Rosa to keep the temp up. Everything made it no problem. Lots of corals broke due to the move. So I had to make frags of a bunch of them. The tank had a bad outbreak of some type of burgundy algae that’s very short, soft to touch and near impossible to scrap off. At first it looks like coralline but it is not. So I’m dealing with that. Some of the corals had the previous algae growing on them so I cut those pieces off and threw them out. The tank was overrun with GSP. So, my wife and I arranged as many rocks as we could with the GSP down so it would die off. The others we took out and broke off all pieces of GSP. We even found a rock crab while breaking the live rock. Glad we got him out. The tank came with extra dead rock so we added some dead rock to the tank where needed to fill in the aqua scape. So all the corals looked stressed and some were bleached and browned out. I tested the tank and all parameters seemed ok. I had a suspicion that maybe the refractometer that the previous owner gave me was off. So, I picked up some calibration fluid and sure enough it was reading 5 ppm high. So the tank was sitting at 40ppm salinity. I took 2 weeks to bring it down slowly. I took a half gallon of salt water out each day and replaced it with fresh RODI. Good to hear there wasn’t any casualties. That blue tang is pretty small. He must have gotten it recently. Thanks. I stressed out about the move for the whole week beforehand. I was constantly going over my plan and making sure I had all my ducks in a row. Going bare bottom is new to me, so I’ve been playing around with the mp10 placement to try to keep detritus from settling. I finally settled with staggered on the sides, and added some hydor koralia nano 425’s to the bottom corner of both sides of the overflow box. This keeps most from settling and doesn’t seem to irritate our Zoa garden. More on that later. I’ve also been struggle keep a suction with the dos and ddr combo. As of yesterday, I have narrowed it down to a bad dos ddr tube and possibly a bad dos head as well. Yesterday I converted to ro tubing on the dos. Other things I’ve changed. 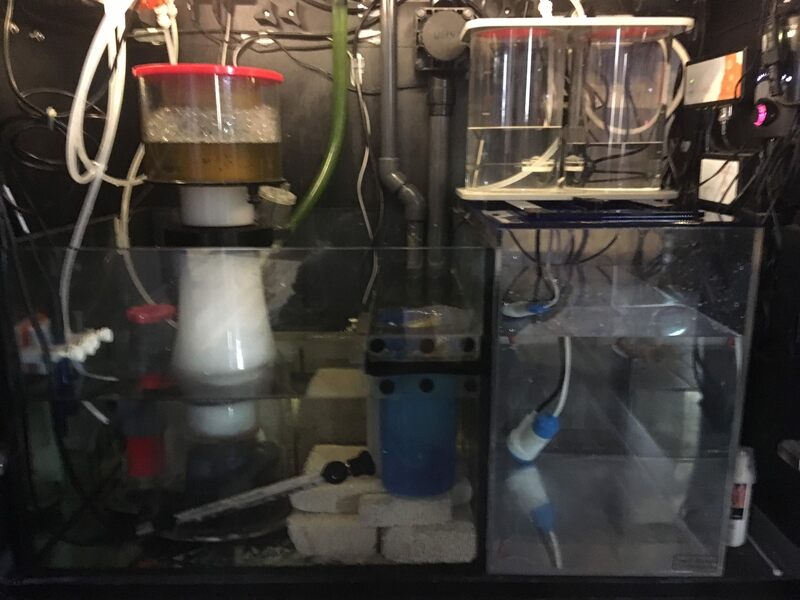 I added one of the 4x8 blocks of marine pure to the sump. I cut it so it fits in the bubble trap and under the filter cups. I replaced the socks with cups because I hate cleaning socks. I have added 4 Mexican turbos and 8 trochus snails to help with the algae issue. Currently I am adding 10 ml of acro power once a week. And I’m still trying to get a consistent dose outta the doser to add 20ml of each 1 and 2 part opfrom b ionic. I’m using the Red Sea blue bucket salt and I tested the first batch of 15 gallons I made and the alk was high...like 12 dkh and the mag was over 1500. That seems really high but I rolled with it. Current Params as of yesterday. Skimmer is working like a boss! Here is a recent FTS. We have added a ton of zoas and other corals. The goal is a bottom covered in zoas and shrooms. We also have all the broken pieces of the SPS healing on the frag rack. They should be available soon. Can anyone ID this LPS on the rock? Can anyone ID the big palys on the right and the bigger colony on the left? Some of these came with the tank and some we bought fromtank tear downs. I don’t think that has a fancy name. A purple and green favia coral. The one on the right that has yellow and green centers with two polyps is probably a Sunny D zoa. Don’t think the colony on left has a fancy name. Looks kinda like a Joker Favia? Ok. Good enough for me on the favia. I already have some sunny d’s. These guys are twice the size and much more vibrant. I’ll get a better picture of the Palys one of these days. Added a trigger systems 10 gallon ATO container. Special thanks to powdertang05 I hope the frags work out. Question...since the ATO container is now taller than my sump, should I run the pumps outlet into my overflow? I’m not sure I can get the water outlet high enough. Or maybe attach it somewhere to the skimmer? I dunno. I have a 1/2" push connect tubing that is cable tied to the emergency drain pipe and I put the ATO output in that to prevent siphon (ATO output line at the height of the drain valve). Make sure you find a way to secure the ATO line somewhere so it doesn't pop out if you do this as well. Coral reefer and Rostato like this. Use a tee fitting in the RO line leading from the pump. Put a valve at the end of the T ad adjust it so only a little bit of flow comes out when the ago runs. Place it inside the reservoir at the highest point and in air. Ato pumps, water goes into sump and a little goes back into the reservoir. ATO stops, the line will try to siphon but the T will introduce air into the line and break the siphon. Now that’s an awesome idea! Thanks!